An increasing number of Japanese tourism industry players are brushing up on Islamic practices and culture to tap the rapidly-growing Muslim travel market, reportedly worth RM390 billion last year. According to Japan’s Foreign Affairs Ministry Second Southeast Asia division director Naoki Kumagai, Malaysia is seen by many Japanese companies as a gateway to the lucrative Middle East market. “Japanese businesses find Malaysia a comfortable place to learn and invest, thanks to the relationship between the two countries as well as Malaysia’s status as a peaceful and stable Muslim nation,” he said, here, recently. Akmal Abu Hassan, a Malaysian entrepreneur based in Japan, has been at the forefront of efforts to help Japanese companies develop halal products and obtain halal certification. As the managing director of Malaysia Halal Corporation Co (MHC), Akmal has been hard at work explaining not only the requirements of halal food production but also introducing Islam to Japanese businessmen. “Halal food is not just about the method of slaughter (of meat) or avoiding alcohol, but also about ensuring good hygiene and safety. “In that sense, Japanese businesses have an advantage since they already adopt a high standard in food preparation. “The challenge is convincing them to include Islamic requirements and this involves explaining to them why those requirements are necessary,” he said recently. He said MHC’s motto is “Halal for All”, which makes it clear that halal need not mean catering exclusively to Muslims but also includes the average Japanese consumer. He said the approach involves compromises while ensuring that religious requirements are heeded. “For example, you cannot tell Japanese restaurants not to serve alcohol as drinking is an integral part of their lives. Akmal, who has lived in Japan for more than two decades, said MHC issues halal certification adapted from regulations developed by the Federal Territory Islamic Religious Department. Hotel Granvia, Kyoto’s top luxury hotel, last July became the first hotel in western Japan to be certified by MHC. In addition to halal menus at its restaurants, the hotel also prepares prayer mats for Muslim guests and can convert its banquet hall into a mass prayer facility if needed. Hotel Granvia’s overseas marketing director Shiho Ikeuchi said she has since been flooded with enquiries from around the world, indicating the high demand for such facilities from Muslim travellers. 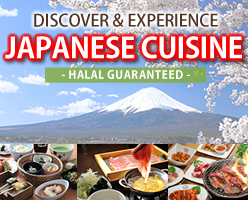 The Japan National Tourism Organisation is also planning to create an official guidebook for Muslim tourists, listing halal restaurants and places of worship. Copyright © 2015 MHC Co., Ltd. All Rights Reserved.